The following is an objective review of the SaTT ICO. The review is based on certain criteria, which we think are important for an ICO project to succeed. We measure a successful ICO by short term and long-term ROI estimation. The following is not financial advice. 3.3.1 3.3.1 What are Oracles? 3.3.2 3.3.2 How will Oracles work? 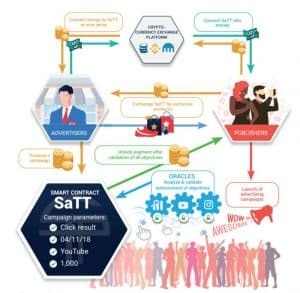 SaTT which stands for “Smart Advertisement Transition Token” is a project that aims to govern online adverting, mediating between advertisers and publishers using smart contracts on top of the Ethereum blockchain. 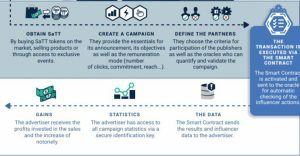 The SaTT solution wants to use the decentralized blockchain capabilities to vastly improve the way the online advertising industry operates today, and automating transactions with smart contracts in a distributed blockchain ledger could reduce costs, speed up transactions, prevent fraud, and enable better and more accurate monitoring of campaigns. The company behind the SaTT innovation is ATAYEN, based in the US, France and Tunisia. ATAYEN, Inc. was founded in 2014 by Gautier Bros and Stephanie Clement, Facebook applications developers. Today, the company’s main business is Iframe-apps offering customizable apps that enhance and add capabilities to Facebook marketing pages. The company states that its apps are installed in over 4 million Facebook pages worldwide. 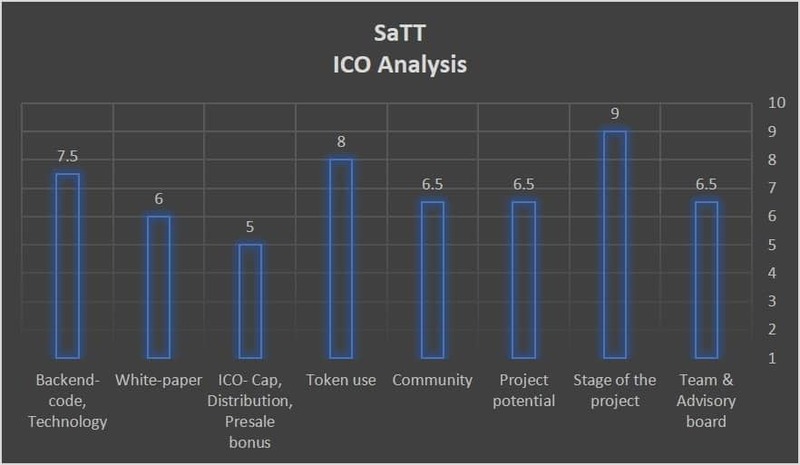 The SaTT token presale successfully ended last April and the crowd sale started on the 1St of May and will go on until March 31, 2019 or until the Hard-Cap is reached. Let’s start with our evaluation! The online advertising market is constantly growing and changing rapidly, analysts predict that by 2020 half of all global adverting cost will be spent on online advertising, in the past year alone the digital advertising revenue was 247.87 Billion USD. Advertisers use different ways to monitor the effectiveness of their campaigns. The most common ones are CPC (cost per click) and CPM (cost per thousand impressions) yet none are completely accurate, and all could be fraudulent. Advertisers can misinform publishers diminishing the success of the campaign, publishers can use fake accounts or bots to maximize their monetization, and advertising agencies can use their power to cheat their partners. In this vast global market advertising agencies find themselves in charge of paying commissions to many affiliates around the world, as a result commissions get delayed, fees grow, and time and energy are wasted, furthermore finding the right publisher that is suitable for an advertiser’s need is no easy task. To create a campaign advertisers need to obtain SaTT tokens which they can either purchase on markets or offer products and services in exchange for them. The advertisers input the essential details for the campaign such as the content, the model of remuneration and define the criteria’s for publishers, then they lock their tokens within the smart contract and set an expiry date for the contract, the campaigncontract is then broadcast to the blockchain and activated. After activation it is automatically checked by the Oracle for publisher reward-worthy actions. Publishers can be individual accounts on social media networks, sites or applications, in order to get the opportunity to take part in a campaign and fulfil the target specified in the smart contract, they have to meet certain conditions specified in the smart contract, for instance the requirement might be for individuals that have more than X number of followers on a specific social media platform, or for a media outlet that does not host any illegal streaming content. Profiles of publishers are analyzed and segmented so publishers can receive proposals that suit their profile. Once the Oracle validates that the publisher executed their part in the contract the payment is released to the publisher according to its actions, the publisher is rewarded with SaTT tokens which can be redeemed for cash on exchanges or used to buy products offered by the advertiser. Oracles are basically API’s (Application programming interface) that will integrate with the SaTT smart contracts. The interface will integrate with different data sources, for instance Google Analytics, Twitter, Facebook, and get information from their API’s determining whether the actions required in the contract were executed, i.e. number of clicks or page views or a certain amount of likes that were received on a Facebook post. SaTT will enable multiple Oracles to be involved in confirming the same smart contract transaction. 3.3.2 How will Oracles work? Oracles are privileged account addresses within the smart contract, initially Oracles will be developed and validated manually by ATAYEN, Inc. and at a later stage could be developed through the SaTT API by third-party developers who will be rewarded with commissions in SaTT tokens if advertisers choose to use the Oracles they contributed, advertisers will, of course, be able to choose the Oracles most relevant to them and that they find most trustworthy. On the other hand, publishers can choose not to take on a SaTT contract if they feel that it is using an Oracle that isn’t fair or worthwhile. These provide measurable statistic data such as number of views, clicks, leads engagement or sales, such data can be obtained of course from sources like Google, Facebook, Twitter, etc. Capacity Oracles can provide advertisers with critical data about publishers such as their reputation, validity, background, type of audience, market segment, and so on. Reech, Social Mention are a few companies that can provide such information through Oracles. These Oracles can detect fake accounts and bots that are used to manipulate advertising results. These services can block bot traffic and ensure that the performance results are not faked. There is already a working SaTT wallet. However, it is currently only available after login-in with a Facebook account. The wallet currently supports Ethereum and of course SaTT tokens, but in the future, it is planned for it to support further cryptocurrencies. The wallet enables sending cryptocurrencies directly to other Facebook users without requiring an Ether address or setting the gas price which is determined automatically by the last few blocks median gas price, the gas limit is fixed to make the wallet more user-friendly for non-technical users. Atayen plans to integrate other third-party auth applications such as Google, Linkedin and Civic in a later stage. Total Hard-Cap: $28,560,000 for 34% of 200 Million tokens that will ever be minted. Pre-ICO ($420,000): Successfully concluded, 100% Bonus. Public Sale ($49,560,000): May 1st 2018- March 31st 2019, max bonus of 50%, the bonus percentage goes down to zero as the sale progresses. Token Allocation: 34% of tokens distributed, 27.63% reserved for the company, 9.38% for API purposes, 7.5% team and advisors, 10% partners, 2.5% Bounties and 5.25% crowd sale bonuses, 1.88% each promotional tokens for Facebooks validated Pages and Users. ATAYEN, Inc is accepting payment for its applications in SaTT Tokens, one of their leading services is a newsletter app for managing mass emailing campaigns, and is available using SaTT tokens. A store offering different products accepting SaTT tokens is available for clients, a PayBySaTT API was launched and enables merchants to accept SaTT tokens as payment in their online store. Dec 2018: SaTT Connect v1.0: Oracles will be created by ATAYEN,Inc. based on data from Google Analytics, Instagram Analytics, and YouTube Analytics. Atayen.inc, founded in 2014, is an established company with a proven track record. Their products are installed in about 3 Million Facebook pages with around 1 Million users. Atayen.inc will use the existing client base to penetrate the market with the SaTT solution. SaTT is trying to use blockchain to make digital advertising more efficient and by doing so take a chunk of this huge and growing industry. The use of a smart contract in order to ‘post’ and advertise a job on the web with restrictions that are custom made and easy to follow-up, is an innovative approach and the right and relevant use of smart contracts – a trustless mean of communication between parties. It will be very interesting to see how the advertising market uses the SaTT solution. There is already a working SaTT and Ether wallet available for use with extended capabilities such as Facebook authentication, adding contacts, affiliation rewards, and Atayen.inc services are available for purchase using SaTT tokens. The blockchain team has no proven record of blockchain projects, and there are no meaningful partnerships. A great way to penetrate into the crypto ecosystem is by collaborating with meaningful strategical partners and investors from the crypto sphere. It is sometimes crucial for a project to succeed. Though lowered, the Hard-Cap is very high, and the spread between the hard cap and soft caps is problematic, projects that raise a lot of money leave little room for price growth of the token once it is listed on exchanges post-ICO.